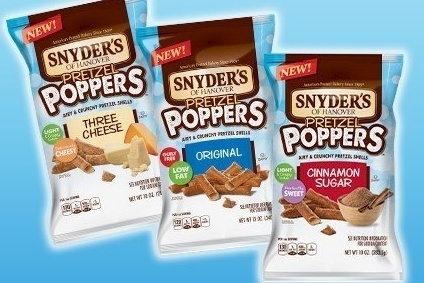 US snack maker Snyder's-Lance has revealed details of its latest new product push. The company has developed a new range of "bite-sized" corn snacks, expanded its line of gluten-free pretzels and added flavours to a number of product stables. The group has introduced Korn Krunchers, small-sized corn snacks available in three flavours. Snyder's-Lance has broadened its range of gluten-free pretzels with two "new options packed with flavour" - honey mustard and onion, plus hot buffalo wing. Flavour is also central to additions to ranges under the Cape Cod brand - to Waffle Cut, Kettle-cooked potato chips and to the Limited Batch line. Snyder's-Lance said it had also brought back Cape Cod popcorn due to "overwhelming consumer demand". The details of the new products, issued on Friday (21 February), follows news of the launch of Bolds, a range of crackers containing "bigger, bolder flavours". "Our newest product innovations and increased marketing support demonstrate Snyder's-Lance's commitment to meeting the snacking needs of consumers from bold flavor experiences to better-for-you snack options," Rodrigo Troni, chief marketing officer for Snyder's-Lance, said. Speaking to Wall Street analysts on 7 February when Snyder's-Lance issued its results for 2013, CFO Rick Puckett said the company was launching a "significant number of new products". Puckett revealed the cost of the launches, including advertising, marketing and promotions, would mean the company's first-quarter earnings would be lower than this year.